HARRISBURG – Rep. Karen Boback (R-Lackawanna/Luzerne/Wyoming) has announced the availability of a single $12,000 annual scholarship to Valley Forge Military College for a student residing in the 117th District. “I encourage any student considering enrollment in Valley Forge Military College to learn more about this program and apply for this great scholarship opportunity through a special legislative appointment,” said Boback. Students seeking participation in the Valley Forge Military College Legislative Appointment Initiative for the 2016-17 school year must have a minimum SAT score of 1,000 or a 20 on the ACT and an overall grade point average of 2.5. Extracurricular activities, community service and leadership will also be considered. Boback noted that the selection process will be conducted by a committee gathered for this purpose. Prospective applicants should contact her Dallas district office at (570) 675-6000, or her Tunkhannock district office at (570) 836-4777 for an application. Candidates who have questions about the program, the college or the completion of the application should contact Siobhán Cusumano at the Valley Forge Military College by calling (610) 989-1310. The deadline for students to apply to Boback’s office is Feb. 11, 2016. The scholarship is funded by the college and no state allocations are made to the program. Any student is eligible for the scholarship, not just those with previous affiliation with the Armed Forces. More information is available at Valley Forge Military Academy and College. Interested students must obtain an application through either of Boback’s district offices, located at 1108 Twin Stacks Drive in Dallas or at 133 West Tioga St., Suite 4, Tunkhannock. Applicants are cautioned not to submit their application through the college’s website if they are seeking consideration for this scholarship. 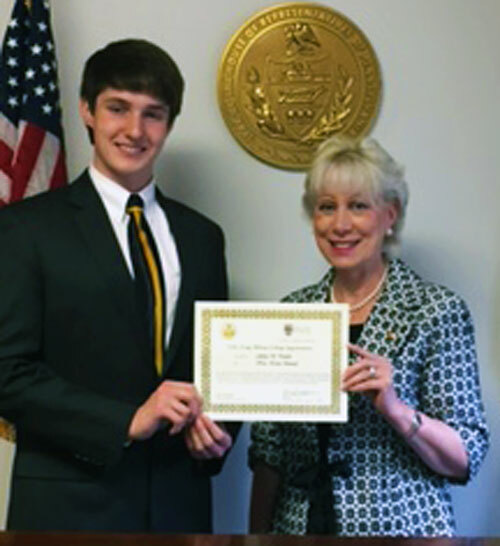 Jeffrey Dudick, a student from the Columbia County Christian School, was the 2015 appointee to the Valley Forge Military College and a nomination to the U.S. Army’s Early Commissioning Program. Dudick is pictured with Rep. Karen Boback (R-Lackawanna/Luzerne/Wyoming). He is the son of Chester and Jannell Dudick of Hunlock Creek. The appointment was a result of the Valley Forge Military College Legislative Scholarship Program. Dudick is the first student in Boback’s district to receive the honor.